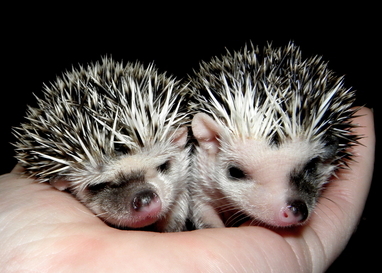 We encourage potential new owners to do plenty of research prior to bringing home a hedgehog. The questions on this reservation form help to give us a better idea of what you know and how well you are prepared, as well as whether you would be a good match for one of our babies. You will not be "rejected" due to inadequate knowledge or inaccurate information - we will simply make corrections or suggestions where necessary, or point you toward good resources for additional research. This is for the sake of the hedgehogs we breed, to ensure that they are going to good homes and will be well taken care of. If you are younger than 18 years old, please have a parent or other adult in your household fill out the reservation form. Include the name, contact information, prior hedgehog experience, etc. for both of you. This person must agree to be responsible for the animal's care, including veterinary costs. They also must be involved in purchase arrangements and present at the time of purchase. After we receive your reservation form, you will receive an email within 3-5 days (usually under 24 hours). The email will go over our deposit and selection process, current availability, provide suggestions or additional information based on the answers you give, and answer any questions you may have. If you do not receive an email within 5 days, please email us directly at volcanoviewhedgehogs@gmail.com to verify that the reservation form was received. Please also check your "spam" folder, as our email replies sometimes end up there by mistake. DO NOT use a smartphone (including an iPhone) to fill out the reservation form. Most of the time it will not come through on our end. ONLY use a laptop or desktop computer, or if you use any sort of mobile device, please email us to confirm that the reservation form is received. It appears that some browsers do not consistently show the embedded form. If the form below isn't showing up for you, click here for the direct link.